On August 23rd, Spuyten Duyvil brings its soaring vocals, jug band energy, and tightly crafted songs to Caffe Lena in Saratoga Springs. With Spuyten Duyvil (pronounced "SPITE-en DIE-vil"), every performance is a barn-burning romp through the last 100 years of American Roots music. "They are the hottest new band in folk music ... and one of the best", says legendary WXPN Folk DJ, Gene Shay. Seeing a Spuyten Duyvil (pronounced "SPITE+en DIE+vil") show for the first time is like "throwing a cherry bomb into a lake" (Rich Warren, WFMT). It wakes you up. Their brand of original and traditional American Roots music blends Olde Time, Blues, 2nd Line, Bluegrass, and Folk Rock with a pinch of Punk Rock energy to create a uniquely modern mix. 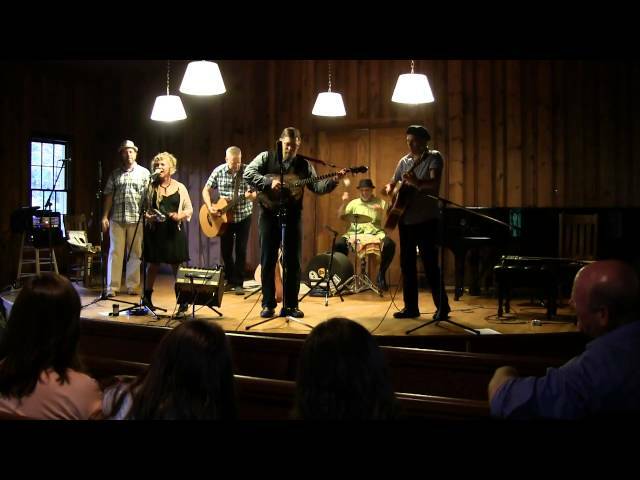 Lead by song-writing couple, Mark Miller and Beth Kaufman, this seven piece powerhouse brings barn burning energy to venues throughout the Northeast. It’s an exciting time for the Hudson Valley based band. Their CD, “Temptation”, released October 2013, made it to #7 on the Folk DJ Chart in it's first full month out. "I'll Fly Away" grabbed the #2 spot. "Temptation" also made it to the top #20 on the Roots Music Report and into the top #30 on the Roots 66 Airplay Chart. Their 2011 release "New Amsterdam" landed on a dozen DJ Top 10 lists and received a nomination for the Alternate Root TV's "2011 Top American Roots Album". 2014 tour stops include Citi Field (formerly Shae Stadium) for the New York Mets Plaza Concert Series, The Brooklyn Folk Festival (NY), The Philadelphia Folk Festival (PA), Caramoor's American Roots Festival (NY), The New Bedford Folk Festival (MA), One Longfellow Square (ME), The Falcon Ridge Folk Festival (NY), Music Mountain (CT), WNTI STAGE (NJ), The Sandywoods Center For the Performing Arts (RI), The Heartland Cafe (IL), WFMT Presents at Serosun Farms (IL) and other fine venues.